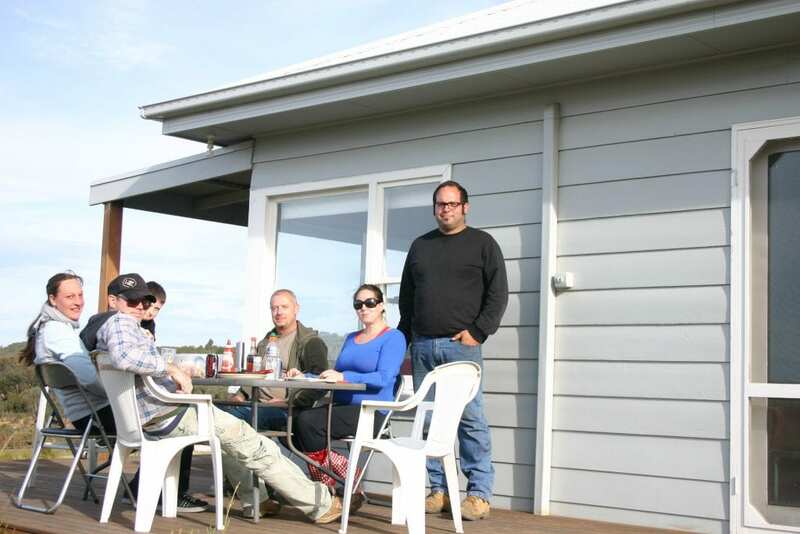 BUILDER Lee Hunter knew central Victoria had what he needed to create a sustainable lifestyle on his Strathlea property. 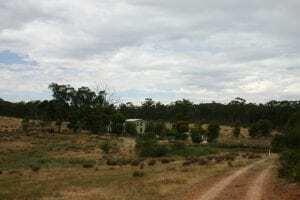 Lee’s 48ha property has dams, self-replacing native forest to provide wood for fuel and the area is a goldmine for his favorite building material – dirt. Lee bought the land in 2003 and by 2006 he had built his two storey compressed straw modular panel and internal mud brick wall house. 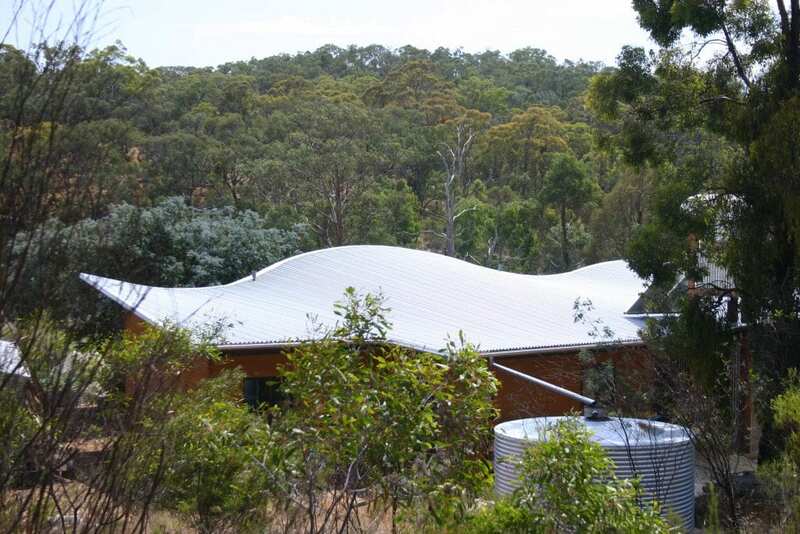 The house has its own solar energy and waste management systems and is set well back from the road near two dams fringed with gum trees. The upper floor has a spacious bedroom with an external deck and a variety of different size double glazed windows for the views and natural light. On the ground floor the house has doors and double glazed windows on both north and south facing walls that allow natural cross ventilation. There are quirky design features like the small staircase leading to the upstairs bedroom and the Stanley combustion stove that dominates the main living area. The stove is also a water heater. The galley kitchen off the main living room has a five-burner oven and a refrigerator, both on LPG gas. At the eastern end of house are the wet areas of laundry, toilet and bathroom. An A and A Company worm farm waste disposal system takes all Lee’s grey water, sewage and organic waste and converts it into a liquid fertiliser that is dispersed via underground pipes. 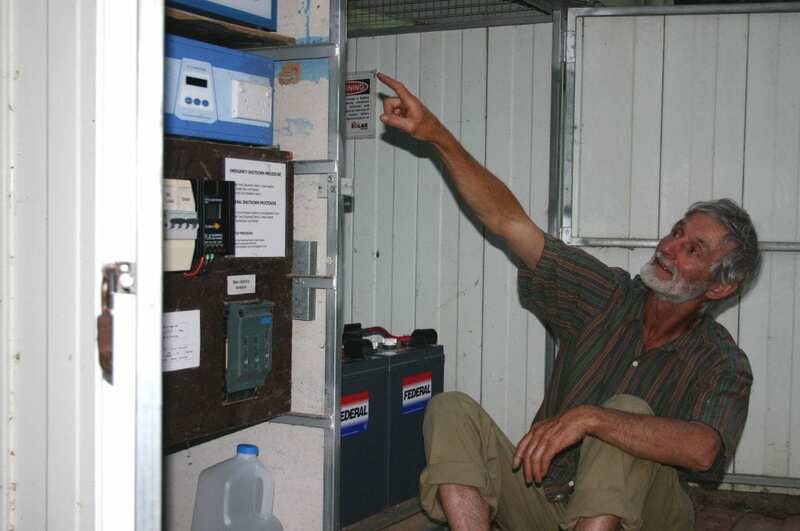 Lee’s power comes from four 165 watt solar roof panels connected to a Selectronic Sine Wave power inverter and he stores electricity in four six volt Federal deep cycle batteries. 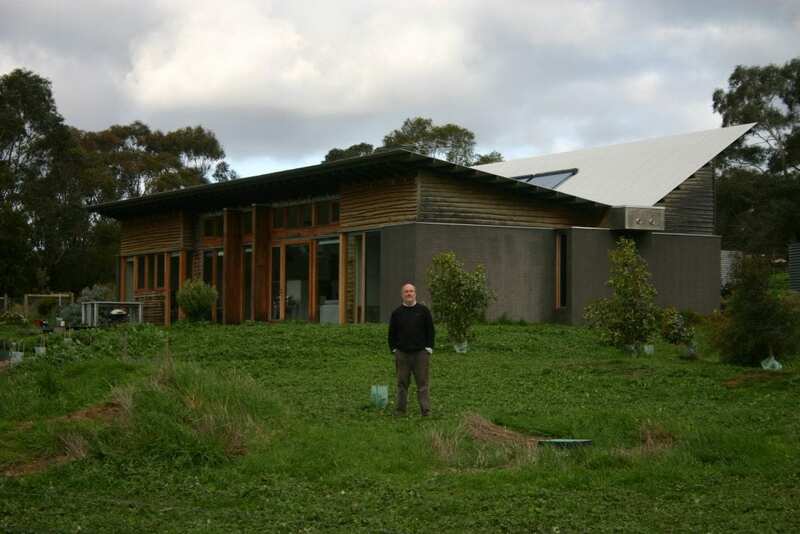 Power of sun: Lee Hunter uses a 660 watt solar panel system with battery storage at his Strathlea straw panel and mudbrick house. Lee estimated his maximum power daily load use would be about 600 watts so he installed a modest solar array but has a 1.6 kilowatt inverter so he can increase his power. Lee said he learned about Ortech Industry’s modular compressed straw wall and ceiling building panels from industry contacts and he began to investigate. Ortech’s website states its Durra panels are made of wheat or rice straw fibres. The Durra manufacturing process combines extreme heat and compression in a dry extrusion process to form the panel’s rigid core. A natural polymer in the straw is released during the process and a water-based PVA glue is used to enclose the core with a durable recycled paper liner. The company says this process produces zero toxic waste. Lee said the Durra panels are load bearing but his house has also been made stronger as metal straps attached to the uprights that hold the panels are tied into the mud bricks. Inside Lee’s home most of the exposed walls are mud brick to take advantage of mother earth’s natural insulation properties. Lee said the mud bricks were made with suitable clay and rubble materials sourced from a nearby town called Bealiba and were bagged with mud from his dam. To bag the internal walls Lee wet the mud bricks then applied the mud render with a brush. Looking at the home’s walls from the inside to the outside, first comes the mud bricks that weigh 17 kilograms each and measure 37cm long, 25cm wide and 11cm deep. Dirt cheap: Lee Hunter’s double storey sustainable house has mud bricks for its internal walls to capitalise on mother nature’s natural insulation properties. Behind the mud brick wall is a 40mm cavity and then the Durra panels. The panels slot into H-section metal rails on each side and sit in a U-section rail at footing level. The Durra panel is blanketed with builder’s foil insulation wrap and the exterior part of Lee’s house is a rendered Blue board*. The house has a corrugated Colorbond metal sheet roof. Below that there is builder’s insulation foil wrap then 3.5 rated insulation batts in the ceiling cavity. Durra panels form the internal ceiling. 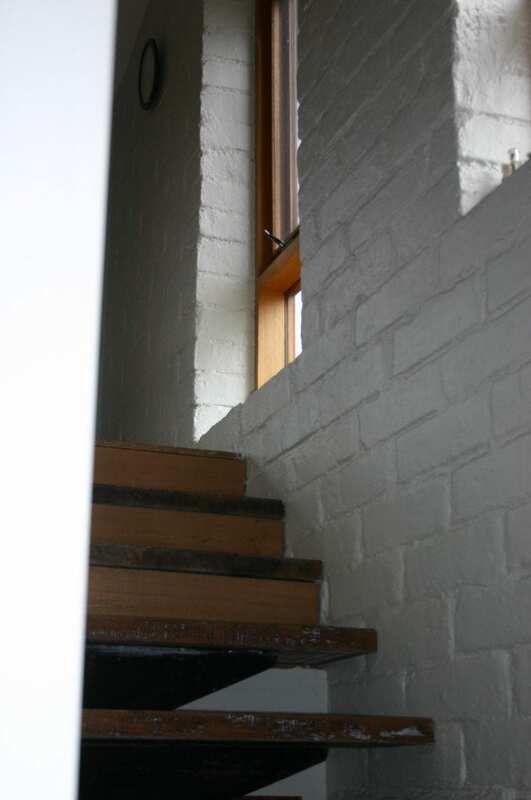 The gable end walls upstairs are the same construction as downstairs except for the rear wall that has been finished with plasterboard. When I arrived at Lee’s house it had been a 30 degree plus Celsius day but inside Lee’s home the temperature consistently hovered around 20 degrees. “I don’t know what insulation rating is but I know it’s usually between 10 and 12 degrees cooler in here on warm days,” Lee said. Lee has been in the building trade since he began a five-year apprenticeship as a 16-year-old when he learned to build conventional homes. He said after living in northern NSW he learned from people sharing his alternative lifestyle how to use mud to build bricks for houses. He read and learned more and this ultimately led to him make his own mud bricks and build a 6 metre by 2 metre cabin with a 2 metre ceiling at Ruffy in the Strathbogie Ranges. “I would have to say mud is a valuable building material because it is available to everyone,” Lee said. *Blue board is a cement sheet with a blue water resistant film on it. 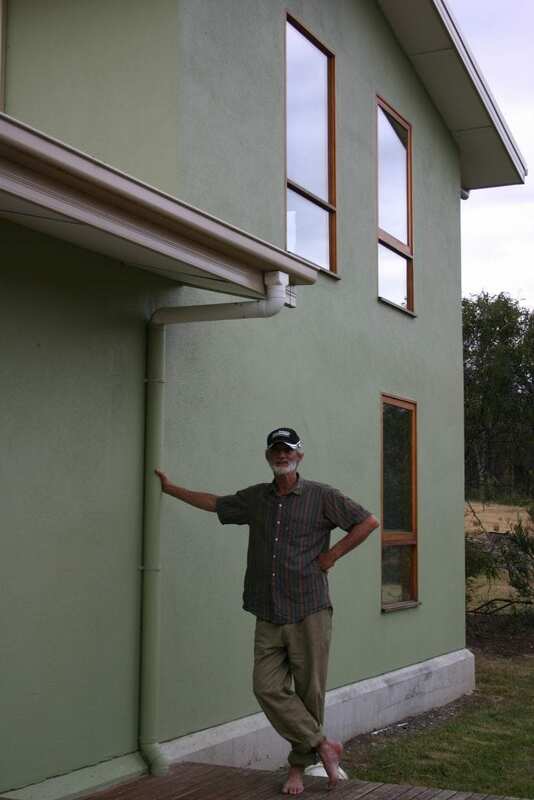 Life in the straw: Lee Hunter knew Strathlea in central Victoria had the raw materials he needed to maintain a sustainable lifestyle and to help build his two storey straw panel and mud brick house.